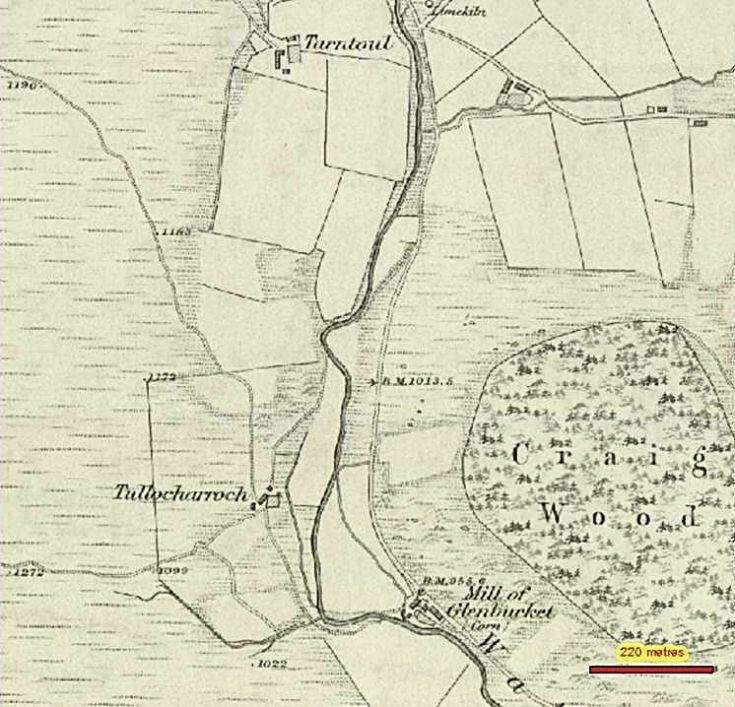 Tullocharroch (Glenbuckct). ? Tulach carrach, "stony knoll." The unreclaimed land around this farm is very stony. All that can be seen of this farmstead, which stood at the edge of a terrace above the Water of Buchat, are a few lengths of stony banks and scarps. The 1st edition of the OS 6-inch map (Aberdeenshire 1869, sheet LX) depicts three roofed buildings strung out in a line from NE to SW, with a garden enclosure to the E. The central building was almost certainly a cottage, and the other two were probably outbuildings. On the later map the NE building is shown roofless. Visited by RCAHMS (JRS), 26 September 2000. When you look at the site today , this is not surprising as the site is a marsh with water running down from the hill. William Chruy was born in Dockington. He married Jannett Dasson on July 19, 1747 in Glenbuchat. William Chruie, b. September 24, 1749, Sunnybrae, d. December 29, 1820. Catherine Chruie, b. Abt. 1766, Glenbuchat, d. October 30, 1831, Glencorny. William Chruie (son of William Chruy and Jannett Dasson) was born September 24, 1749 in Sunnybrae, and died December 29, 1820. He married Margaret Davidson on April 12, 1774 in Glenbuchat. John Chruie, b. December 26, 1776, d. October 4, 1857. Jean Chruie, b. June 15, 1777, d. November 9, 1811. William Chruie, b. may 2, 1779, Sunnybrae farm, Glenbuchat, d. November 14, 1855, Glenbuchat. James Chruie, b. June 30, 1781, Glenbuchat, d. October 24, 1867, Glenbuchat. Anna Chruie, b. December 19, 1786, d. bet. January - May 1840. John Chruie (son of William Chruie and Margaret Davidson) was born December 26, 1776, and died October 4, 1857. Jean Chruie, b. April 10, 1814, d. December 18, 1892. Jean Chruie (daughter of John Chruie and Jean Davidson) was born April 10, 1814, and died December 18, 1892. She married James Reid on September 30, 1838 in Glenbuchat. Anne Reid, b. 1837, d. September 29, 1868. Mary Ann Reid, b. 1839, d. December 1, 1893. Jean Reid, b. January 3, 1842, Glenbuchat, d. October 19, 1929. Isabella Reid, b. January 14, 1843. John Reid, b. June 28, 1845, d. May 6, 1869. Charlotte Reid, b. August 29, 1847, d. May 13, 1916. James Reid, b. November 17, 1849, Glenbuchat. Elspet Reid, b. January 19, 1852, d. July 9, 1868. Archibald Reid, b. February 5, 1854, d. July 19, 1886. William Reid, b. 1856, d. November 27, 1893. James Reid (son of James Reid and Jean Chruie) was born November 17, 1849 in Glenbuchat. He married Annie Laing on May 28, 1879 in St Machar, Aberdeen, daughter of John Laing and Elizabeth McInnes. Notes for James Reid: Was living at the time at 195, Carden Place, Aberdeen.